Okay, so it’s Day 4 of my plan, and already I’m cheating by using a photo that I did not take today. But I was looking through photos from the past weekend, editing them to be uploaded to our online album, and I just couldn’t resist pulling this one. Hetty, as I’ll call her, is a Herdwick sheep living on the steep hillside below the lofty ruins of Corfe Castle in Dorset. She’s just been caught taking a break from her duties, as her face is unbearably itchy and she’s sneaking up behind this tree for a good scratch. 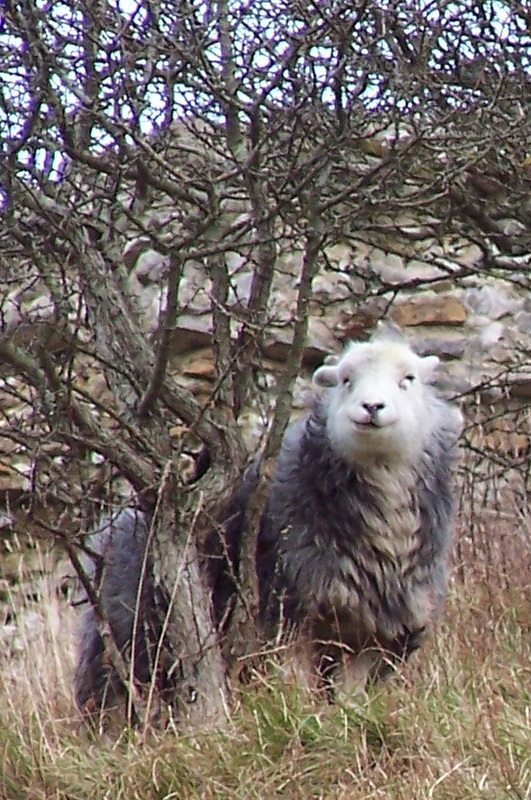 Hetty and her fellow Herdwicks, along with some smaller brown Soay sheep, have been stationed at the castle by the National Trust to keep the hillside vegetation from running rampant. This is a common, environmentally friendly, and cost-effective practice employed by the Trust at many of its properties; we frequently encounter various breeds of grazing sheep and sometimes ponies as we approach castles or stately homes or wander down National Trust trails. These four-legged groundskeepers ensure the ear-splitting racket of lawnmowers and strimmers (weed whackers) won’t shatter the peace of the surrounding countryside, and in fact add an element of authenticity to the vistor’s clichéd expectations of rural England. Nothing completes the English experience like scraping sheep poo off your shoes.